NOT for the first time, every one of the main national daily and Sunday newspapers available in Scotland has experienced dips in their their latest year-on-year sales figures in the country. THE Sunday Herald yesterday carried an article about the history of the French satirical magazine, Charlie Hebdo – the scene of a fatal attack by gunmen on Wednesday. It was written by former staff writer, Arnaud Gonzague. A FORMER BBC Scotland senior manager has been appointed to the newly-created post of senior vice-president at the Scots division of PR agency, Weber Shandwick. Andrew Jones joins from Robert Gordon University where – says Weber Shandwick – “he headed up the multimedia journalism programme for undergraduate and postgraduate degrees”. Previously, he was ‘head of North’ for BBC Scotland with – adds the agency – “responsibility for both editorial and corporate leadership across production centres in Aberdeen, Inverness, Kirkwall and Lerwick”. Meanwhile, Weber Shandwick has made three further appointments, at its Aberdeen office: Lindsay Jepp, Mhairi Greer and Andrew Gill. JUDITH Duffy, in yesterday’s Sunday Herald, pens a piece, headed: ‘Supersizing the schedules: Why TV’s appetite for fat shows will only get bigger’. 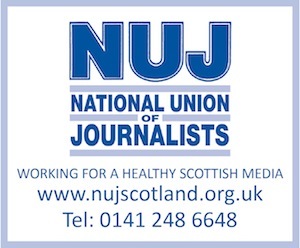 IT’S annual general meetings time, and this evening, one of the two Edinburgh branches of the National Union of Journalists is holding its one. It’s the turn of Edinburgh & District this evening; it’s next Monday for Edinburgh Freelance. BEGINS Simon Bain, in The Herald: “The digital revolution has raised the stakes for Scotland’s ability to build a strong technology sector, and the skills to support it.